We, “Elcom International Pvt. Ltd.”, are well known and most respected Manufacturer and Supplier of Din Connectors, Power Entry Components IEC Outlets-C13 and Power Entry Universal Sockets & Adaptors. We established in the year 1981, at Kolhapur, (Maharashtra, India). We manufacture these products with the utilizations of quality raw materials and up to dated technology. Our engineers are most accomplished and equipped with up to dated machines. They manufacture these products keeping in mind the current market standards. Furthermore, the offered arrays are available in many specifications to meet the client maximum demands. Our offered assortments are highly demanded and respected for many grounds like quality assurance, cost effective rates, durability, smooth finish, high rectal, strong build, strong fixture and easy installations. We have built a strong and most modern infrastructure unit that enable us to offer quality high goods to our customers at cost effective rates. Our unit is spacious and modern in approach. Our unit have most modern and up to dated technology. In addition to all this, our unit is further divided into many sub departments like manufacture, sale, customer care, promotions, advertisements and delivery. We are blessed to have most talented and qualified engineers that work very hard in make our business process run in a hazzle free manner. Our engineers too work in close cordinations with our customers to understand their exact requirements to offer as per the same to them. We are working on the central motive of making our customers happy and delighted. Our talented engineers manufacture these products with the assistance of quality raw materials and modern technology. Moreover, we have a team of quality controllers that keep a close track on the fabrications and keep the quality high as per set quality parameters. Our quality controllers are most experienced and equipped with latest technology and quality controlling machines. We make our customers satisfied on many grounds like transparent dealing, apt delivery, ethical business process, transparent dealing, quality assured goods, best after sale service and cost effective rates. With long years of conformity and skills in this realm, we are engaged in offering quality assured gamut of this realm. We are working under the headship of “Ms Namrata / Mr Santosh Nair Head of Sales and Marketing (Sales Coordinator)”. His deep market understanding and conformity encourages us to work in the same directions and offer as per the same to them. Manufacturing, Trading, Importer and Exporter of Electronic Components. 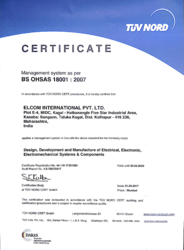 Established in 1981, with its factory in Kolhapur and Headquarters in Mumbai, Elcom International Pvt. Ltd. has been at the forefront of offering Electrical components and Electronics & Electromechanical solutions with a focus on developing a world-class product-mix to cater to the requirement across a wide range of industrial, manufacturing and renewable power market segments. Elcom has developed its strength in the design, development and manufacturing of a wide range of products in line with the customer’s requirement, encompassing major OEMs globally. 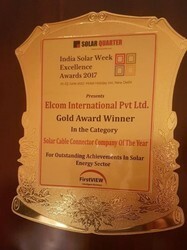 The company has been a pioneer in this sector in India, leveraging its experience, knowledge and legacy since 1981 in electronic and electro-mechanical technology. Its current facility strategically located in Kolhapur along the Mumbai-Bengaluru expressway corridor in Maharashtra, India is spread over an area of 4 acres. 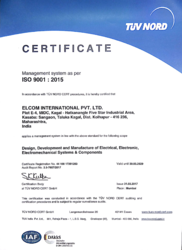 Elcom is one of the initial 100 companies in India to get certified by ISO in 1996. In order to manufacture the quality assured goods we have build a modern and most sophisticated infrastructure unit. This unit spreads over large area of land to hold bulk consignments in a safe manner. It is further divided into many sub departments like manufacture, sale, customer care, advertisements, promotion, and delivery and after sale service. All these departments are managed by our most experienced mangers. 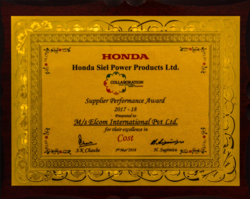 Elcom International awarded the Supplier Performance Execellence in Cost 2017-2018 by Honda Siel Power Products Ltd.
Elcom International awarded Third Consecutive Year with Solar Cable Connector Company of the Year 2018 by Solar Quarter for its outstanding contribution in Solar Industry.